From a starting point of classic three piece heavy rock, GMT pillage all boundaries and perform instrumental acrobatics that no other three piece rock band can even hope to come close to: but under no circumstances would we want you to get the idea that this is a few introspective musicians widdling away for their own self indulgent satisfaction. RAW – LIVE is loud, it’s heavy, it rocks, it is fired up with feeling and primal raw energy. Bernie Tormé, John McCoy, and Robin Guy play to the edge of their abilities, giving their all to the moment, and rock with punchy anthems while also pulling fully formed improvisational magic from out of nowhere: listen, for example, to the jams on Perfumed Garden and Longer Than Tomorrow. 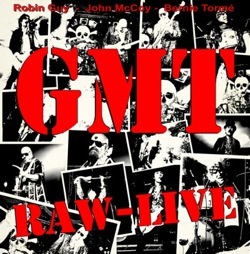 RAW – LIVE contains live performances of stage favourites from the two previous GMT albums, Bitter and Twisted and Evil Twin, as well as some previously unrecorded live gems such as Hendrix classic Fire (given a blistering GMT rendition), and Gillan’s No Easy Way.